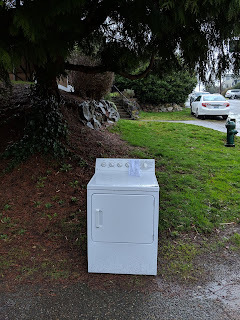 This week, someone in our neighborhood left their washing machine out on the street with a sign saying it was free (but needed a couple of new parts). 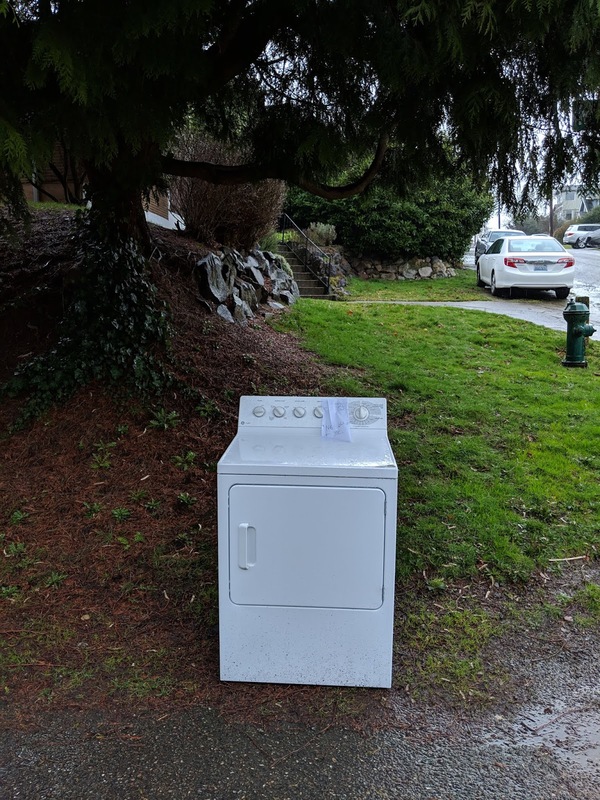 It just sat there for a few days, and now on a stormy day it is absolutely soaked and covered in the nastiness Seattle winters provide. This honestly is such a bummer, because I assume it is now ruined (or if it isn't yet, it will be soon). Poor little washing machine never had a chance! Getting rig of things that we are done with can be hard, and it's easy to throw it on a curb and hope that a fairy will come and take it away. Or we wait for the garbage truck to come and take it away. We want it to go away as fast as possible, and we don't want to have to deal with it. It's time to accept that even if it is time to move on, it's not time to throw away. Even an old stove or "vintage" dishwasher can still be a blessing to someone else if it works. And maybe you can't get it to work the way you want it, but it might be just fine for someone else. In other words, do not throw that washer, stove, fridge, or other appliance away before you check out these options first. Every second of use life those appliances can get is more time out of the landfill. That's the goal. 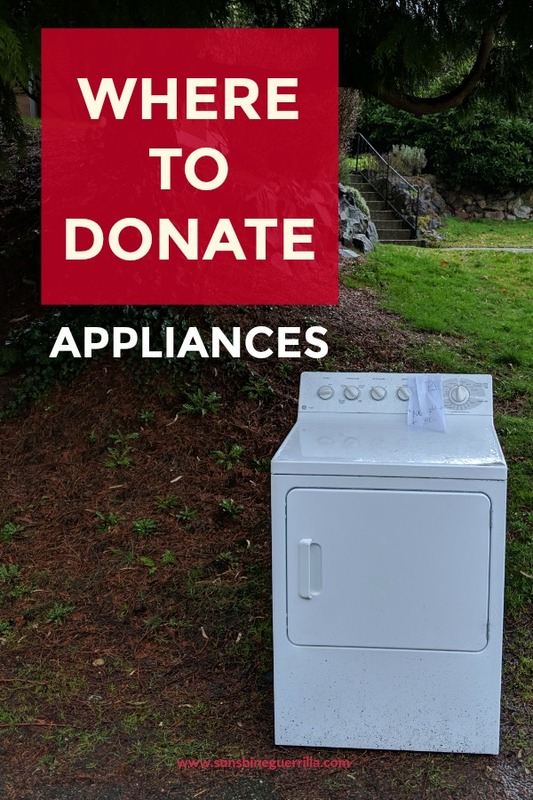 That said, most charities don't want broken appliances. Be absolutely sure it is working before you hand it off to someone else, so if it has a missing part or needs something fixed, address it before you give it away. Also, be sure to clean out that appliance before handing it off! For a washer, running it a few times (maybe with bleach) can rinse everything out to have it ready for its next user. Ok! Who's ready to do some good? I have seen people gift washers and dryers and refrigerators on Buy Nothing multiple times. The Buy Nothing Project connects neighbors into hyper local facebook groups, where neighbors can offer each other things for free. You can find yours here. What was outdated or ill-fitting for one family was an absolute lifesaver for their neighbor. Even things that look pretty rough can have a few years of use left in them, letting someone save or plan before having to buy something pretty expensive. Don't have a Buy Nothing? Try Freecycle or even offering it on a buy/sell group for free. Handing it off person to person means you can be sure it gets use. You might even be surprised by a neighbor who has more talent fixing things than you have. These reStores are popping up all over the United States, and they are absolute gems. Not only do they fund Habitat for Humanity and their mission to build homes for the people; they also have created a huge resource for donating and reusing building supplies, furniture, and appliances. 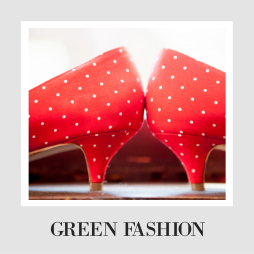 They save so many perfectly useful items out of landfills! If you have never been to the one near you, visit! They are paradigm-shifting (and they can save you major money if you are on a budget). For our purposes, they take appliances, and will even pick up larger things for free. Check the website. Find your store. I cannot find you a more deserving and useful organization for this purpose. 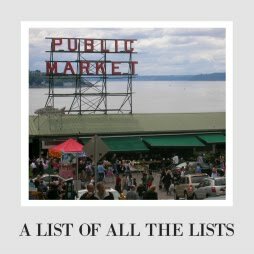 Our neighborhood is looking to have it's own building reuse store called Ballard Reuse. They sell cabinets, plumbing, and even appliances. I have also seen a lot of organizations for local support of people with disabilities or homes for homeless people. Every area has its own needs (including yours), so take a minute to do the research and see how you can help where you are. Larger thrift store chains, like Salvation Army, Goodwill, and St. Vincent de Paul will accept some appliances, but not others. They all also come with their own ideological/ethical baggage, so you have to decide how you feel about those things. THAT SAID, an item that doesn't end up in a landfill is always a victory, so if they are your last resort, even an organization you aren't crazy about is worth it. Give it to a scrap metal place, because they can break it down into pieces to be reused. If you are buying the replacement from a larger store, ask what they do with the ones they take away. They may be more intentional about their disposal, and they might be a great resource (that's a big maybe, but it doesn't hurt to ask). Do NOT send it to a dump when parts can be reused! Ok! You can do this. Don't be like my neighbors and just leave out on the street in the rain. Someone can use that, and you can do the work to make that happen. Enjoy all that fresh shelf space! Such a good feeling to get rid of things you don't need! Want to do more donating? Check out The Great Donate 2019 for more inspiration and ideas.